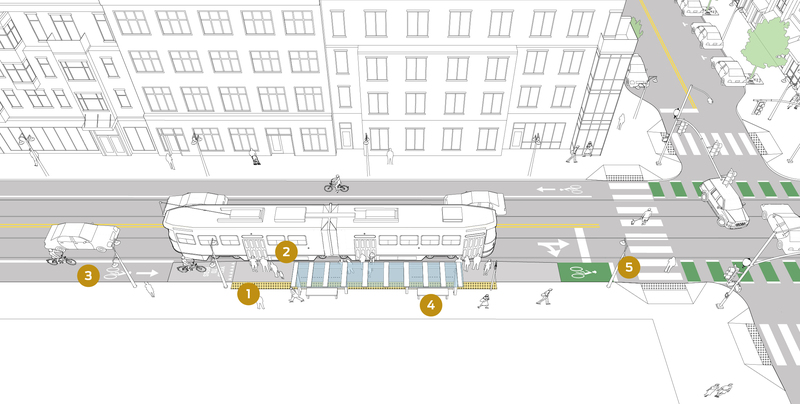 Shared cycle track stops are an important retrofit option for constrained transit streets with in-lane stops, especially of streetcars, if a boarding island configuration does not fit in either the street or the sidewalk. In shared cycle track stops, a bike lane or protected bike lane rises and runs along the boarding area, along the extended curb, rather than wrapping behind the boarding area. 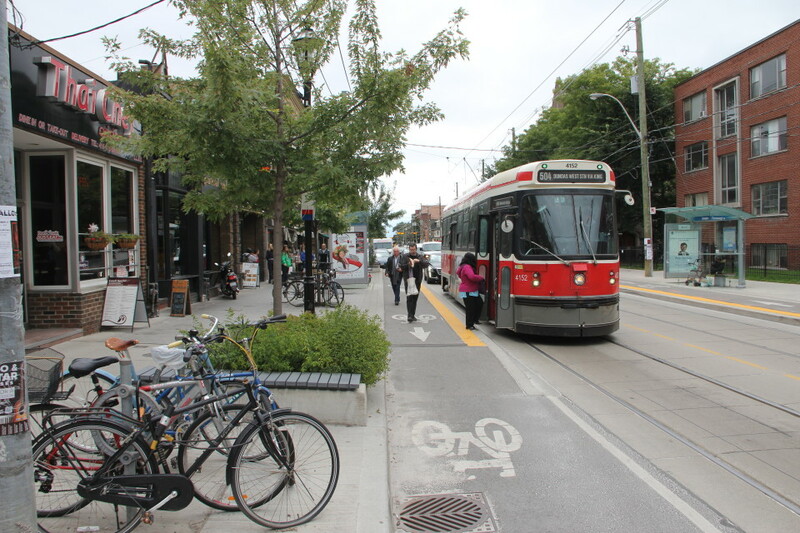 Bicyclists can ride through the boarding area when no transit vehicles are present, but must yield the space to boarding and alighting passengers when a bus or streetcar stops. 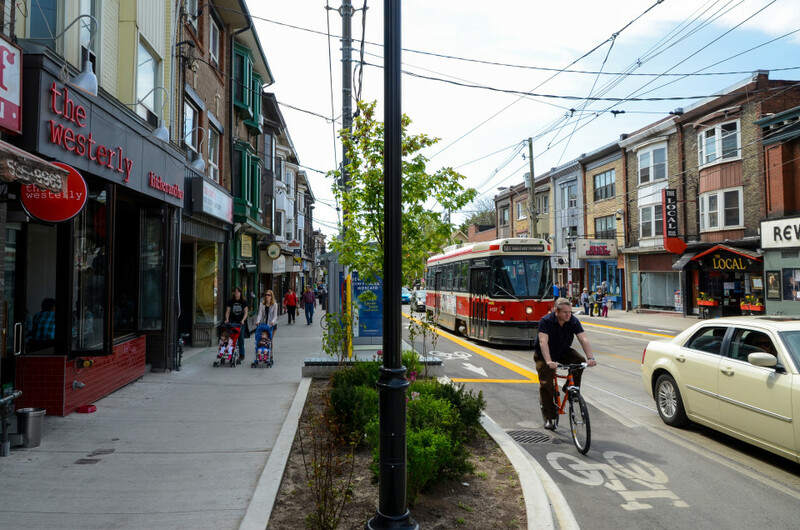 Used where limited right-of-way precludes boarding islands, including on streets with standard bicycle lanes, or where level boarding buses or LRVs are used. Generally occurs in a curbside condition; if street parking exists in the cross section, space may be available for a boarding island or bulb. 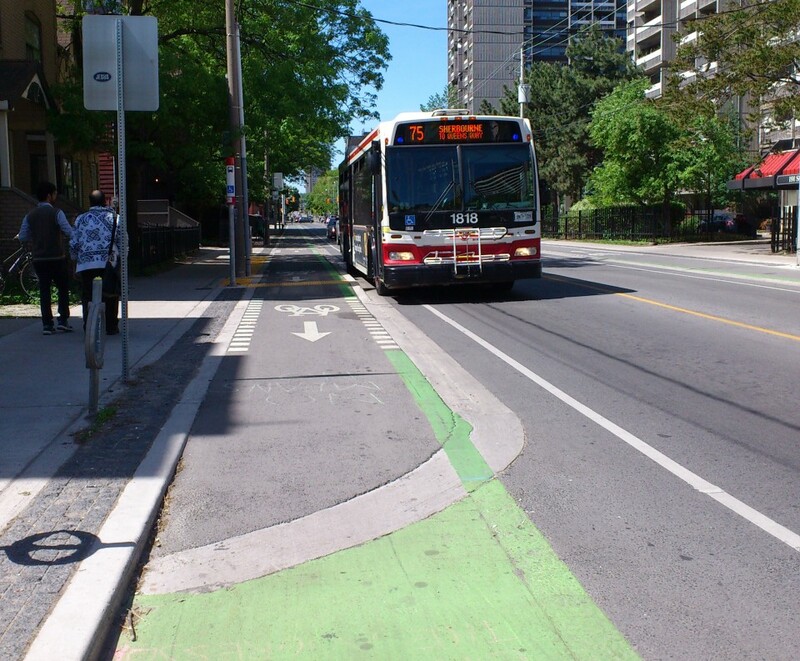 Bicycle lanes ramp up to platform height before the stop, and then ramp down after. Bicyclists should be at street grade at intersections. On streets with light rail, allows bicyclists to stay out of the track zone when passing boarding areas. Provides more space for transit passengers and amenities while maintaining a clear pedestrian path on the sidewalk. 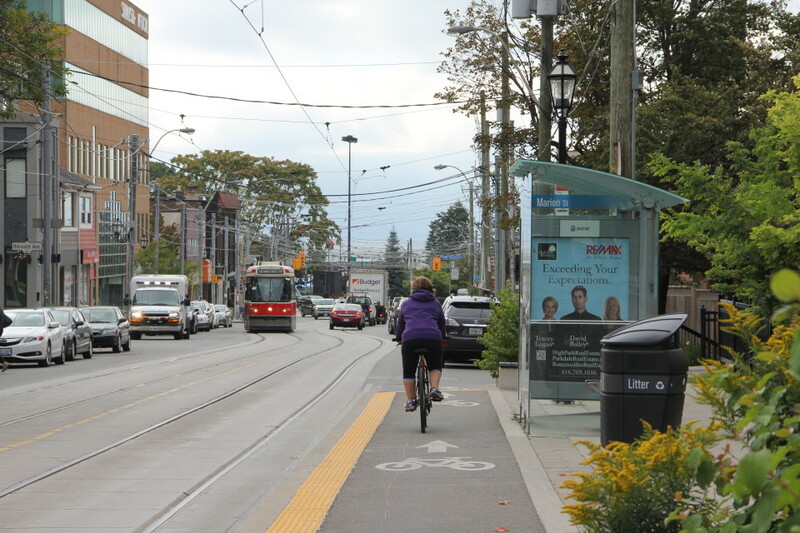 Space within bike lane can be used to partially satisfy accessible boarding zone requirements. Can facilitate level or near-level boarding. Measures must be taken to ensure bicyclists yield to boarding and alighting transit passengers; compliance is critical to providing safe and comfortable conditions. Place detectable warning strips along the edge of the sidewalk where passengers step into the shared raised boarding area, and along the boarding area curb where passengers board the transit vehicle. Use shark’s teeth yield markings near the top of the bicycle ramp leading to the platform. The whole width of shared cycle track area can be used as the accessible boarding area for wheelchair lifts. However, wheelchair users must have a waiting area provided that is accessible to allow maneuvers to the space, and must be located outside of conflict areas. Slope of bicycle ramp shall not exceed 1:8. Shared boarding locations require comprehensive multi-sense information to guide visually disabled passengers. Provide audible announcements that a transit vehicle is arriving, including the route name if multiple routes are present. Curbside activities that will conflict with bike movements and visibility (such as lay-bys or parking bays) must be prohibited at minimum 20 feet from either direction of the bike ramps. 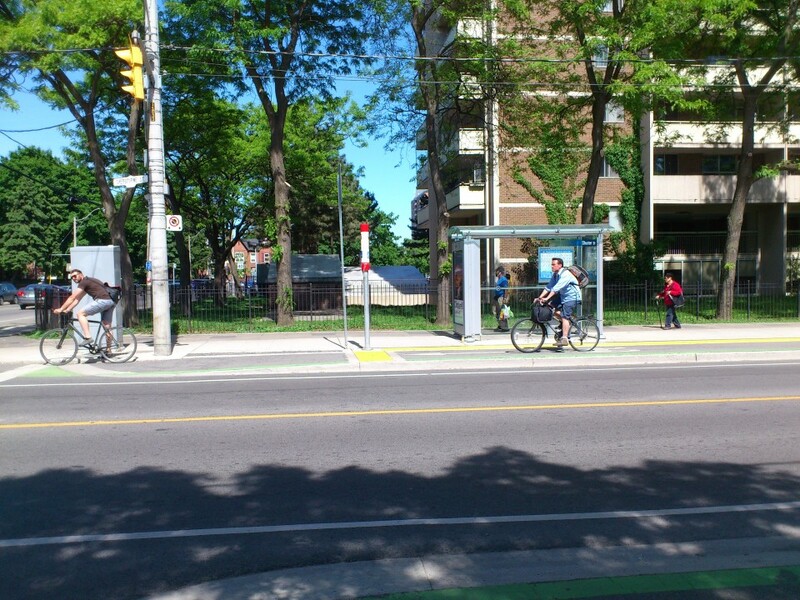 Where transit shelter is closer than 3 feet to bike lane, it should open to the building side to maintain accessible paths and to avoid pedestrian conflicts with passing bicycles. Shelter should be transparent to allow waiting passengers and bus operators to see each other. Ensure bicyclists are well positioned in view of turning traffic. Terminate the boarding platform at least 10 feet from the crosswalk to allow bicyclists to queue in front of transit vehicles. References for Shared Cycle Track Stop: 1 found. Luciano Rabito, et al. 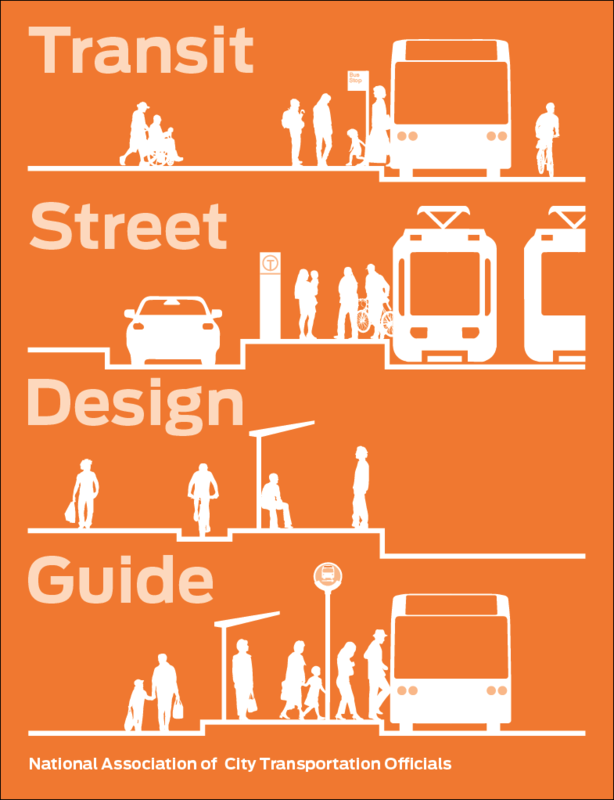 "Separated Bike Lane Planning & Design Guide." Massachusetts Department of Transportation, Boston.